Though this process you can easily Bypass FRP Samsung S8 Plus, finally we found a process to Unlock Google verification Samsung S8 Plus easily, Now here we share that method, follow this if you also facing the FRP lock on your device, only you need a working PC and Downloading Some FRP files and FRP tools that, this will help you to Bypass FRP and Access your device home screen once again. so follow the right way to Bypass FRP Samsung S8 Plus easily. Make Sure: We tried this Method on Samsung Galaxy S8 SM-G955F FRP Bypass, also you this method helps you to Bypass FRP from SM-G950F FRP Bypass. 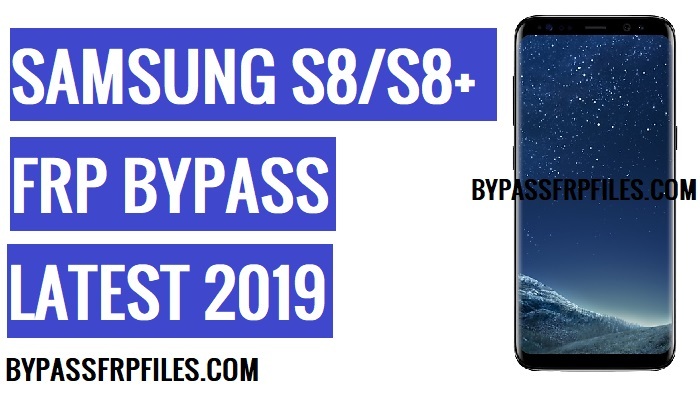 Samsung has updated their security level, Samsung fixed all the security bypass process that help us to Bypass FRP, so we working on new method find the best solution to Unlock Google verification Samsung S8 Plus -Android 9 easily. -After that, Press and hold the (Volume Up + Bixby+ Power) key together, until you see Android logo appear on your device screen. -Then release all the keys. -After that, press (Volume UP and Power) key same times once to Bypass SM-G950F FRP Bypass. -Then there you will see your device firmware version (G950FXXU1AQDD). -Now download the same bootloader version Firmware and stock Firmware from below to Bypass FRP Samsung S8 Plus. Here we share the one Stock Firmware file, but if your device is updated bootloader version then you need to Download updated Stock Firmware by following below process. -First of all, follow this step to download Stock firmware for your Samsung Tab A. -We want to Download latest stock firmware so that’s why we want to share a website “Sammobile.com” because we need the latest version of Stock firmware to Bypass FRP Samsung S8 Plus-Android-9. -Then, you need to sign in or sign up to download the stock firmware. -After the sign in process is complete then choose “free account” there. -Once done, Then go to the “Firmware” tab and put your device model name and then download latest stock firmware according to your device country and model and Bootloader version. -After that, Now follow the main process to complete Unlock Google verification Samsung S8 Plus easily. -Now on the “Recovery Mode” select “Reboot System” by using Volume UP and Down key and then confirm to press the Power key. -Then once again power off your device. -Then press the “Volume Up” key to confirm “Download Mode”. -Download the latest Samsung USB driver. -Then install the Samsung USB Driver on your PC. -Now Flash the latest Combination file on your device. -First, download the S8 & S8+ Combination file on your PC, and also download the latest “Odin” tool. -After that, extract the Odin tool. -Then extract the S8 & S8+ Combination file. -Once all the files extracted, then follow this process to Flash the combination firmware and Unlock Google verification Samsung S8 Plus (SM-G950F FRP Bypass). -Now open the extracted “Odin” flash tool folder. -There you will see “Odin.exe” and run the “Odin” tool from there. -Once the Odin tool is opened. -Then there you will see “AP/CP/CSC/BL” tab there. -Now click on the “AP” tab and then give the file path of extracted combination file folder there. -Check on the “Log Box” there you will see “ADDED” message. -Also check “ID: COM” turn in blue color in the Odin tool. -Now hit the “START” button on the Odin tool to Bypass FRP Samsung S8 Plus -Android-8.1. -Then a green color tab will be appearing on the Odin tool, that’s mean your device will start Flashing. -Once flashing successfully finished. then your device automatically boots into factory menu. -Once your device successfully booting to Factory Menu. -Then Swipe down your fingers to bring “Notification Menu”. -After that, select the “gear” icon / “Settings” icon there. -Then you will redirect to the “Settings” menu to SM-G955F FRP Bypass. -After that, go down and select “About Device” there. -Then tap on the “Software Information” and tap on the “Build Number” 5-7times. -Go back to the “Settings” menu and then go down and select there “Developer Option” menu. -Then go down and then enable “OEM Unlock” and “USB Debugging” mode there. -Once done, then connect your S7 Edge to PC. -After that, download the “ADB FRP” tool. -Extract the “ADB FRP” tool to your computer. -Then open the “ADB FRP” tool. -Now a “CMD” prompt will open. -Then press any key in “CMD” window. -Check on your device, a popup will show tap “ok” from there. -After that, close the “ADB FRP” tool and reopen the tool again. -then press any to Unlock Google verification Samsung S8 Plus. -Done, Now we need to flash the Stock firmware to successfully Bypass FRP Samsung S8 Plus. -Open the Odin tool once again. -Now extract the Samsung Galaxy S7 Edge Stock Firmware. -On the Odin tool (AP,CP,CSC,BL,USERDATA) tab. -Then choose the Stock firmware file to successfully Bypass FRP Samsung S8 Plus. -Note- You have to choose the right firmware file on the right tab. choose “AP” file in “AP” tab, “BL” file in the “BL” tab and then choose “HOME_CSC” file in “CSC” tab. Choose all the files from the “Stock Firmware” folder. Make Sure:- Do not choose the “CP” file on the Odin tool. -Now put your device again on Download Mode. -Power off your device then press and Hold (Home+Volume Down+Power) key, until your device boot into the “Warning” screen. -After that, Press the Volume Up to Confirm the Download mode. -After that, connect your device to PC. -Then click the “Start” button on the Odin tool. -Then the flashing will be started. -Once done, then disconnect your device and Power on your device. Thanks for visiting us, Comment below if you face any problem With Bypass FRP Samsung S8 Plus-Android 9, we will try to solve your problem as soon as possible.